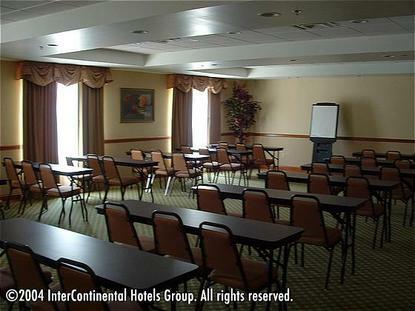 The Holiday Inn Salem Hotel is Salem, Virginia&regs exclusive full service hotel. Our brand new facility is conveniently located just off Interstate-81 at Exit 137, in the heart of the Blue Ridge Mountains. We are minutes away from the following businesses and attractions: U.S. Foods, Medeco, Frito Lay, Rowe, GE, Roanoke College, Virginia Tech, Civic Center, Moyer Complex, and many more. Holiday Inn Salem will pleasantly surprise you with its gourmet Southern Seasons Restaurant, Sunny&regs Lounge with full menu service, free wireless high speed internet in public areas and wired internet in guest rooms, Jacuzzi suites, fitness center, indoor pool and hot tub, on-site guest laundry facility, room service, fax/copy service, and 2400 square feet of meeting space. All of our guest rooms feature a refrigerator, microwave, iron/ironing board, hair dryer, and coffeemaker. The Holiday Inn Salem is the perfect choice for so many reasons. We cannot wait to welcome you to Holiday Inn Salem This hotel is committed to providing accessible facilities under the American Disabilities Act. If your accessibility needs are not met, please contact the Hotel Manager on Duty. Should you require additional information regarding accessible facilities for guests with disabilities, please call 1-800-Holiday (U.S. and Canada) or contact the hotel directly. For the hearing impaired, TDD service is available at 1-800-238-5544 within the U.S. and Canada.